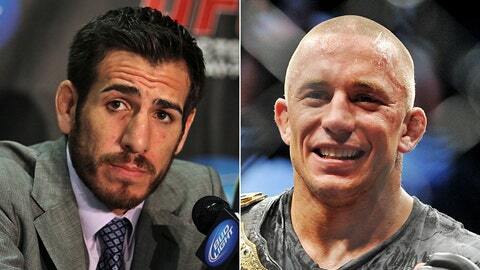 Friend and fellow fighter Kenny Florian weighs in on GSP's indefinite hiatus from the UFC. I’ll never forget the first time Georges St. Pierre called me. It was right around 2009. It was after we had already trained with each other for 10 days. I missed his call and his voicemail with his unmistakable accent was the following: "Hi Kenny, this is Georges. Georges St. Pierre. GSP. From the UFC. I am in New York so let’s train! " He wasn’t saying it in a funny or cocky way; he was saying it just in case I had forgotten who he was. I still laugh about that voicemail. On Friday the 13th, the iconic welterweight champion Georges St. Pierre officially announced his indefinite hiatus and, in all likelihood, retirement from the UFC. Not only was Georges the greatest champion of all time, he was the man who carried a whole nation on his back for every UFC fight since January 2004. Nobody has spent more time in the UFC octagon than the man known by 3 letters, GSP. He has more wins in the UFC than any other competitor in history with 19 and his 9 successful title defenses in the welterweight division are the most by any welterweight champion and the 2nd most title defenses overall. The welterweight division has consistently been one of the most competitive weight classes since the weight class was introduced back around 1999. GSP has reigned as king of that stacked weight class for a very long time. GSP brought true respect and legitimacy to the sport of MMA. He had the good looks; consistency in the cage yet was always reverent in demeanor. Growing up a karateka in St. Isidore, Quebec, Canada, Georges was always a true professional in and out of the cage. The list of top fighters and champions that St. Pierre has beaten throughout his career is truly remarkable. In the UFC, just one slight mistake can be the difference between winning and losing and GSP was able to keep an amazing consistency in what is most likely the UFC’s most difficult division. Georges was the new breed back when he started competing in the UFC and he remained a step ahead of the competition to the very end. In combat, if you are not evolving and improving, you are getting worse. Not only did GSP keep up with the times, he really led the pack with his unique and brutal training regiment. Whether it was his training with the Olympic wrestling team, his sports psychology training, his gymnastics or unique strength and conditioning program, GSP was probably doing it before you. Nobody knew more than GSP just how important it was to be constantly evolving and training with the best in the world. Several years ago before Georges was a big name, he drove his beat up car to New York City for the first time to train at the world-renowned Renzo Gracie Academy. GSP already had what he thought was some good Brazilian jiu-jitsu skills. He trained with a smaller training partner who tapped him 5 times in 5 minutes. This training partner who is now a well known black belt named Shawn Williams was just a purple belt back then and it almost drove GSP to tears. On the long drive back to Montreal Georges had seriously contemplated giving up fighting all together. Obviously we know that he didn’t give up. Instead he trained harder and returned again and again to Renzo’s gym. This to me sums up who GSP really is. He has fears, problems and insecurities just like everyone else. He ignores them and just works at it, fanatically. He doesn’t pick things up like jiu-jitsu or wrestling and just dominates on day one. GSP truly isn’t this freak athlete that everyone turns him out to be. He is however, a freak with his work ethic. Having him as a former training partner I have had a chance to really see what he is about over the years. The volume of training that GSP can withstand is mind-boggling. What got me to improve and fight at a high level was my work ethic and Georges always outdid me and everyone else in training. GSP’s work ethic was at a higher level than any athlete I’ve ever seen, period. If you asked me to describe GSP in one word, it would be ‘MORE’. He always did more. GSP was also smart enough to surround himself with a world class coaching staff and the best sparring partners he could find. From coaches like Firas Zahabi, Greg Jackson, John Danaher, Gia Sissaouri, or Freddie Roach, Georges always had great eyes watching him and helping him through the complex maze of mixed martial arts combat. He sparred with excellent pro boxers, elite muay-thai champions and world class BJJers and wrestlers. If he couldn’t fly them in, he would go and train with them. GSP was fanatical about his training and pushed me to have that same obsession with training. If George went on vacation after a fight, it really wasn’t a vacation because he would always bring a coach or training partner so he could train on his ‘time off’. GSP would find time to have fun and relax but his training was his priority above everything else. There would be no fun if there was no training. Georges will go down in history as one of the best fighters in history and as one of the men who helped take this sport to the mainstream.